When sri guru appears in this world, it is called prakata-tithi, or prakata-prakasa. At that time, mundane people are able to see him, meet with him, and talk to him. According to their own capacity, each person will try to understand who he is, but only someone who has sufficient sukrti will be able to cross over maya and realize sri guru's real, eternal svarupa. Such a person will be able to truly come close to sri qurupada-padma and establish a relationship with him that will develop, step by step, into a permanent connection. Then there will be no more distance between the two. When sri guru disappears from this world, it is called aprakata-tithi, or aprakata-prakasa. At that time, it is impossible for mundane people to perceive sri guru in the eternal spiritual world by their mundane senses, subtle body, or mind. They cannot enter that place. They may try, by meditation or any other process, but their attempts will be fruitless. When we will cross over our mundane senses, subtle body, mind, intelligence, and heart, and instead connect with our soul body, then will we be able to understand aprakata-prakasa, or aprakata-lila. As long as we are arrested by maya, we can only attain some mundane knowledge and realization of the things of this material world. But one who is atmarama and aptakama can understand aprakata-prakasa, or aprakata-lila. He will be able to realize samadhi-tattva. 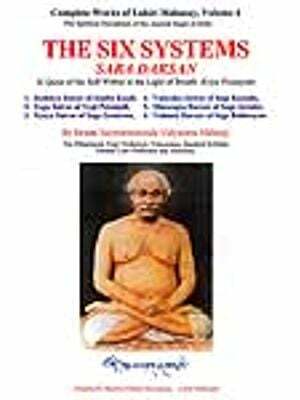 Sri Sukadeva Gosvami is a brahma-jnani, and thus he is able to give realization of aprakata-lila, aprakata-prakasa, krsna-lila, and vraja-lila to Pariksit Maharaja. He can give the pastimes of Dhruva, Prahlada, and all the other bhaktas of the Lord. It is only possible to understand and realize aprakata-prakasa, or aprakata- lila, when we rise above maya. We need to connect with yogamaya instead. Then the Lord's lila-sakti will give us entrance into the Lord's eternal pastimes. At the time of their prakata-lila, sri qurupada-padma and all the maha-bhagavata Vaisnavas give training to the conditioned souls. 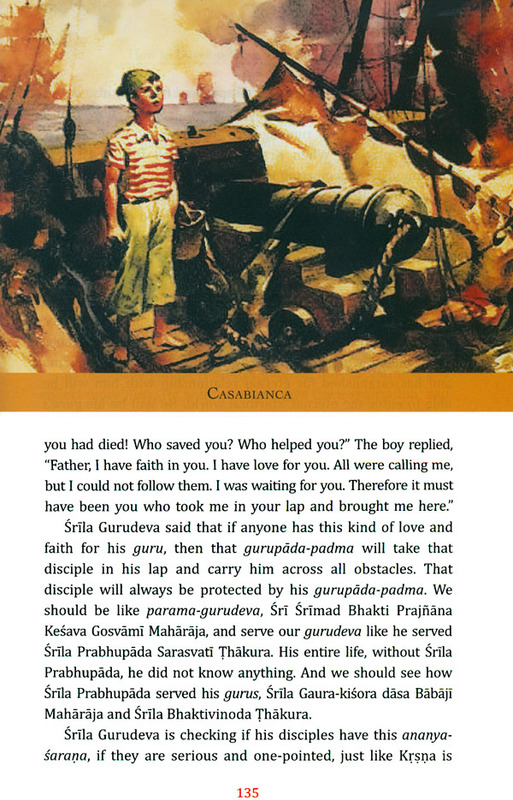 Anyone who seriously follows their program will become qualified, just like Acarya Ramacandra Kaviraja realized both the prakata and aprakata-lila of his gurupada-padma. Sri gurudeva will accept that disciple or follower who continuously engages his mind and all of his senses in guru-seva. He will take away that disciple's attachment to his material body and mind, and replace it by an attachment to his svarupa-anubandi and the Lord's prema-lila. There is a big difference between these two types of attachment. The first is temporary and mortal, whereas the second is eternal and never perishes. This acarya-lila is serious and very important. If a disciple or follower does not complete his training course in this life, he will not be able to understand sri guru. He may be advanced, smart, respected, regarded, and divine, but he will not be present with sri gurupada-padma in his aprakata-lila. Name, fame, and respect of this world do not give entrance into the eternal world, into the eternal aprakata-prakasa, or aprakata-lila. Guru-lila, krsna-lila, and vraja-lila will only appear in the heart of that disciple whose heart is completely clean. 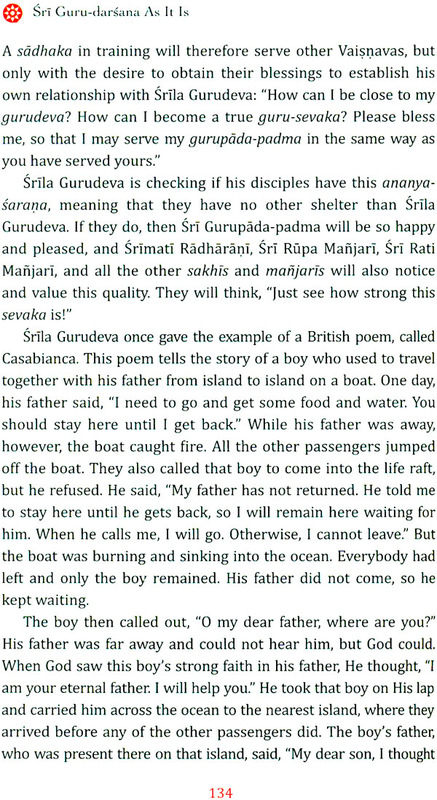 In his book Gopala-campu, Srila jiva Gosvami explains how the sons of Kuvera, Nalakuvera and Manigriva, came to Vraja- dhama by the causeless mercy of Narada Rsi. By the mercy of the Vrajavasis, they became very strong and serious, and at last, by the causeless mercy of Krsna and the unlimited mercy of the sakhas, they attained their permanent post and position in the eternal Vraja-dhama. Now their names are Snigdha-kanta and Madhu-kanta, and krsna-lila is continuously flowing in their heart. Every morning and evening, they narrate this lila to all the Vrajavasis. Krsna is also present there, and so is Srimati Radharani, and all the sakhas and sakhis. All are hearing from them and all are amazed. This is called 'eternal connection and relationship: When we reach that stage, lila-sakti will always be present with us and we will never be able to forget the pastimes of the Lord. Rather, we will no longer remember anything else, just like in Vraja-dhama, Snigdha-kanta and Madhu-kanta never remember their father, Kuvera. 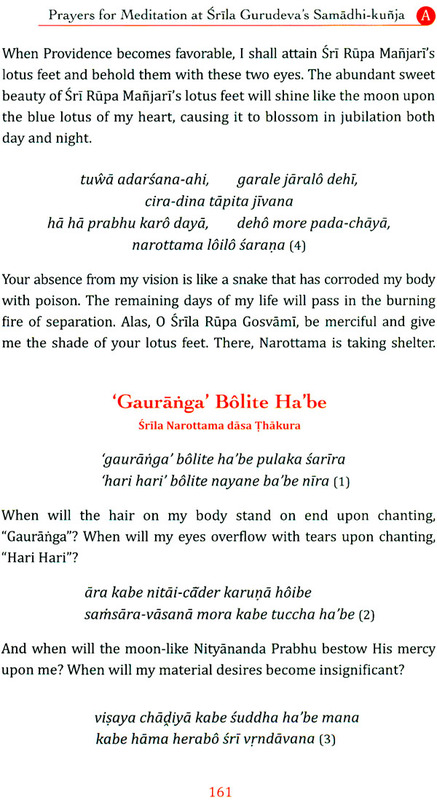 Srila Gurudeva often explained damodara-lila, but how many people understood his advice, instructions, and eternal mood? He desired to take everybody to the eternal Vraja-mandala and give svarupa-siddhi to all. He collected living entities from all over the world and invited them yearly to come to Vraja-dhama. There, for one month, he would continuously distribute the nectar of vraja- lila. But how many people were seriously drinking this nectar? How many were truly present with him. If anyone was with him at that time, they will also be with him now, and understand all the pastimes he is performing at this moment. They are themselves connected and related with Srila Gurudeva, and distribute his lila to others as well. That unbroken flow will never stop. Lila-sakti is eternally present with them, and her mercy flows continuously, eternally. Srila Gurudeva gave us only one mantra: govinda damodara madhaveti. But while Srila Gurudeva was present, most people could not understand the meaning of this. If anyone continuously chants this mantra, he will definitely become a Vrajavasi. Srila Gurudeva wears the saffron dress of a tridandi-sannyasi. He has a fair golden complexion, and is adorned with a tulasi-mala. He is supremely peaceful and his presence bestows peace upon all. By his sweet singing of 'govinda damodara madhaveti; he gives transcendental happiness and attracts the minds of everyone. 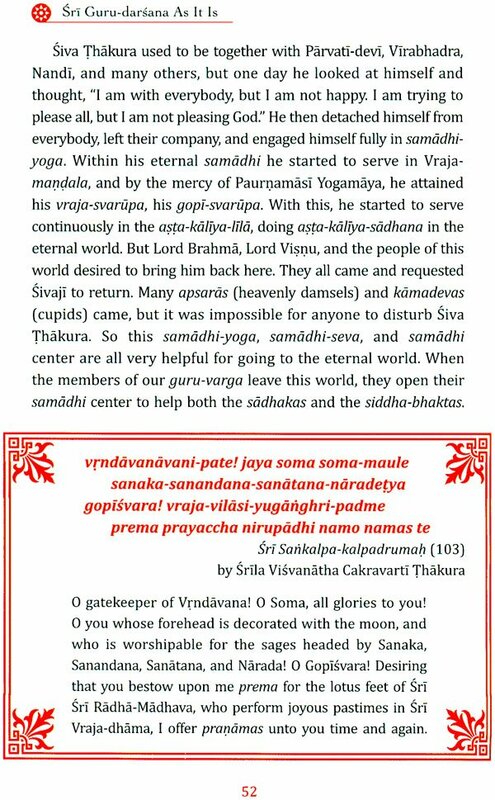 He brings everybody to Vraja-dhama and establishes their relationship with the Vrajavasis, This is the only way to get the mercy of the Vrajavasis and enter into Vraja-mandala. 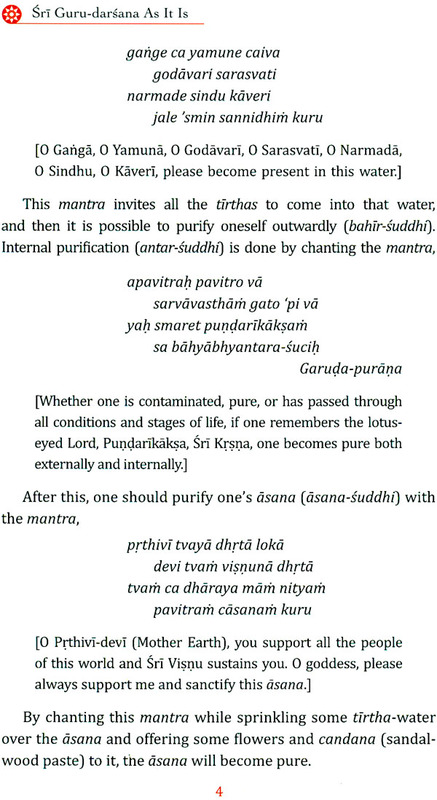 This 'govinda damodara madhaveti' is more powerful than the maha-mantra and the pranava-mantra 'om'. This vani of the Vrajavasis is extremely dear to Sri Krsna, and He is always anxious to hear it. Wherever this kirtana is being performed, Krsna appears with all His associates and begins to dance. Being a reservoir of compassion, Srila Gurudeva moves everywhere and helps all who are drowning in the ocean of material existence. I worship his lotus feet, which are always situated in Vraja-dhama. He is the friend of the devotees and the Vrajavasis. 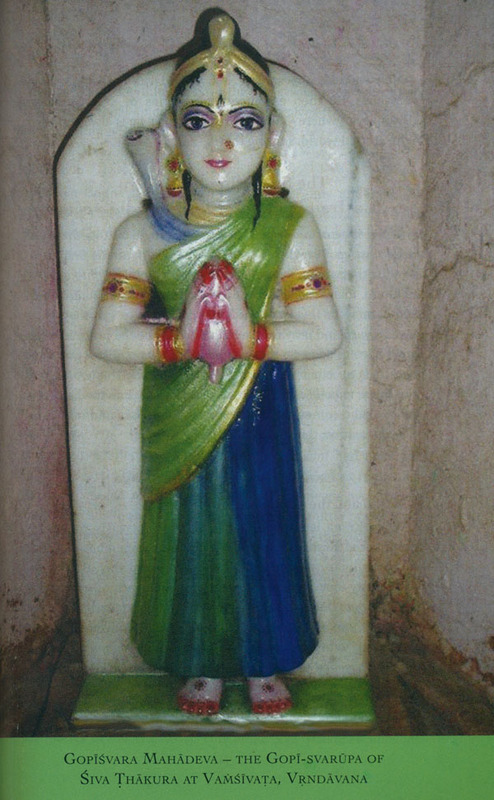 I perpetually serve Srila Gurudeva in eternal Vrndavana- dhama. He only accepts and wears the remnant blue dress of Srimati Radhika, he is the constant companion of the Vrajavasis, the servant of Vraja-bhumi, and the follower of the Vrajadevis.